Congratulations to "Kai", the winner in Sally's giveaway. Thank you to all who participated. My novel In the Dark, as you may have guessed, features a lot of darkness. Some of it is the literal kind, at night in dark alleys and darkened bedrooms, when eyes play tricks and leave us helpless. Some is the figurative kind—the kind that shrouds the things my characters don’t know yet, or lends a frightening air to the darker side of human nature. Both kinds obscure the truth, offer hiding places for heroes and villains alike and, as a result, inspire fear. It may seem a little odd to some that, in this day and age of halogen lamps and rechargeable flashlights, darkness should still be a source—and sometimes a synonym—of fear. Heck, it seems odd to me. But it still gets to me—the murky, unknowable expanse of all the things we don’t know and can’t see, all the people and forces we don’t understand and struggle to trust. I am the kind of person investment counselors describe as “risk-averse.” Generally speaking, things and people I don’t trust send me running the other way. The metaphorical kind of darkness—and the danger it creates—is something I avoid in my real life and relationships. Ulterior motives are something I resent when I sense I’m being used, manipulated or controlled. So when I’m inspired with a new novel idea, am I typically getting excited over reassuring, uplifting stories about regular families working out their troubles, or visionaries who set out in pursuit of a dream and end up changing the world? No, not usually. Not one single time so far, to be honest. What sticks with me about any idea that stays in my head long enough to write it is the darkness. So why don’t I write murder mysteries? I’ve sincerely never yet been tempted. Maybe those are too dark for me. But maybe it’s a little more twisted than that. I think the darkness that gets under my skin is not the over-the-top, indisputably evil kind, but rather the more nearly relatable kind. The kind that’s closer to home. The kind I’m most tempted to ignore. Maybe we’re even taught to ignore it in a million subtle ways, because it’s easier that way. Because it’s comfortable. Because it’s polite. But it’s still there, all around you, in the suspicion that someone you love and trust has lied to you, in the horrible thoughts you see flitting across an ordinary, angry face, in the things regular, usually honest, temporarily desperate people turn out to be willing to do when push comes to shove. In a way, the most frightening part is our own reluctance to believe any of it until it’s too late. So I deny it. I ignore it. And I am fascinated by it. It turns my stomach, and digs in with its claws, refusing to go away until I have dealt with it, soaked in it, shone a light on it, and taken it apart into pieces I can understand, each one attached to a reason I can forgive. In my head, that’s how a nightmare becomes a novel. That’s why it has to. That’s how it ends. What about you? What are the fears you find hardest to shake? What are the monsters under your bed? 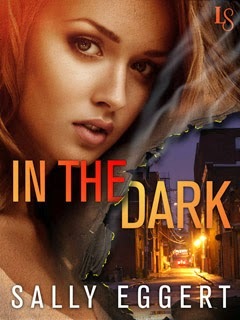 Comment below for a chance to win an e-copy of In the Dark! Sally Eggert first began writing romance as an escape from law school. She is a two-time finalist in Romance Writers of America’s Golden Heart contest and a member of RWA, Washington Romance Writers, the Golden Network, and the Ruby-Slippered Sisterhood. She lives in Paris with her husband and spends her free time playing the violin, knitting, and daydreaming every single day. To find out more, visit www.sallyeggert.com, or find Sally on Facebook and Twitter. Sign up for her mailing list to be notified about new releases and discounts! Giveaway ends 11:59pm EST April 14th. Please supply your email in the post. You may use spaces or full text for security. (ex. jsmith at gmail dot com) If you do not wish to supply your email, or have trouble posting, please email maureen@JustRomanticSuspense.com with a subject title of JRS GIVEAWAY to be entered in the current giveaway. I have a claustophobic condition when I'm in a closed area and can't feel the air circulating around me. I need an opened space. One of my fears... falling from a high spot... me and ladders do not get along. If I use one I cling to it and take baby steps... I am sure I look funny, but it is something I can not shake. Hi, Colleen! Sounds like a sensible precaution to me! Or maybe I just have the same fear. :P Every once in a while, I dream I'm falling from someplace very high--so scary! Thanks for stopping by! Hi, bn100! Wow, lucky you! You must sleep like a baby! LOL. Thanks for commenting! Unexplained noises in the night frighten me. My imagination just takes off. Heights - my hands will sweat and mice and rats freak me out. I even hate Mickey Mouse. My daughter's fears are clowns and birds.